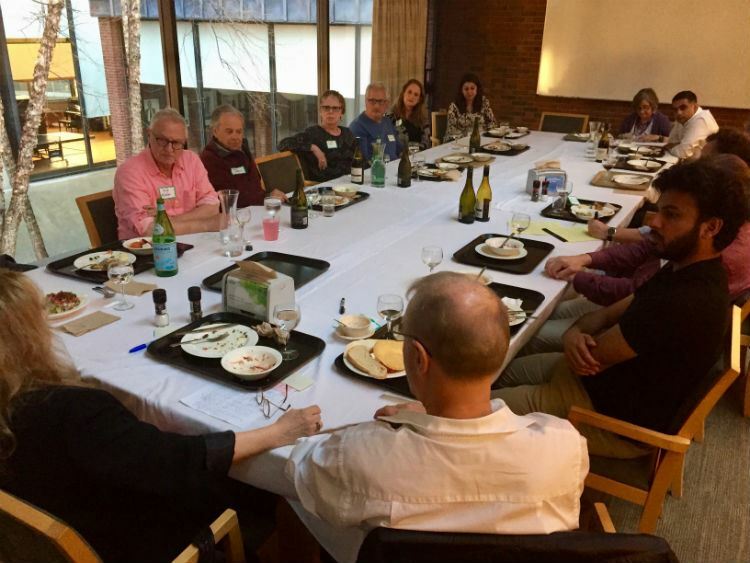 The 20 BBLP affiliates who gathered to dine at Mather House on April 27 to discuss perceptions of Islam included half a dozen BBLP Associates from Pakistan and another 10-12 members of the HR Class of ’73. * After half an hour of mixing we got our dinners, then spoke individually to the lead question of the evening: “What is your strongest image of Islam?” ClassACT Co-chair Marion Dry had done much of the organizing for the event; Board member Leigh Hafrey moderated the discussion. Collectively, we built on the Nigerian novelist Chimamanda Ngozi Adichie’s 2009 TED Talk “The Danger of a Single Story.” (Watch Adichie's TED talk here, and read the transcript here.) In it, Adichie argues that the “single story” is an exercise in power via stereotyping, and as such must be resisted; she argues instead for recognizing a multiplicity of identities within a culture, listening actively to others, and speaking from the variety of one’s own experiences. Over an hour and-a-half, each of the participants spoke from their background and experiences: Natasha Jehangir Khan, Khudadad Chattha, Erum Sattar, Beena Sarwar, and Adnan Awan talked about the plural cultures from which they emerge, the degree of alienation they experience in both personal and conceptual terms in American perceptions of Islam, and the need to build better communication across national identities. In the majority, members of the Class of ’73 testified to relatively homogenous American backgrounds. At Harvard, several of them met their first Muslim in Pinkie Bhutto, and nearly all as adults went on to personal and professional experiences acquainting them with the rest of the globe, including a mix of Muslim-majority countries. Not surprisingly, 9/11 played a major role for us in coming to consciousness of aspects of the Muslim world; participants also debated the relative importance of the media in framing Islam for American audiences, and worried about religion in general as a socializing influence, and the role of jihad in the clash of cultures. In closing, participants agreed that we have much still to learn, that BBLP should continue its convening function, and that the evening had established the foundation for much further conversation. 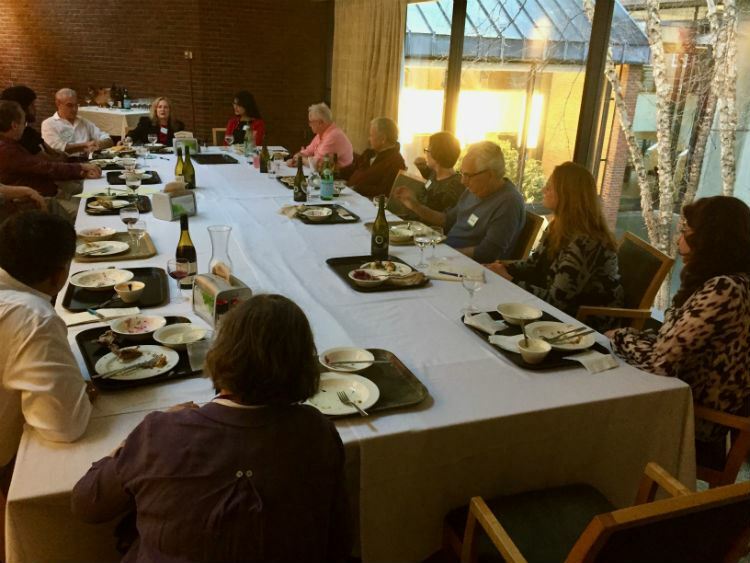 The group then split into smaller groups for additional exchanges; in so doing, they also discovered and enjoyed the cookies, cupcakes, and other “brain break” food that the university Dining Service routinely sets out for Mather residents as they work into the night. * HR Class of ’73 participants included: John Adams, Rick Brotman (and Rick’s wife, Linda), Marion Dry, Rich Golub, Leigh Hafrey, Hugh Kelleher, Barbara Lindsay, Peter Mazareas, Patty Potter, and Holly Weeks.